Free shipping is via the courier if you spend over R850 and live in a central area. All other deliveries via courier or speed services. 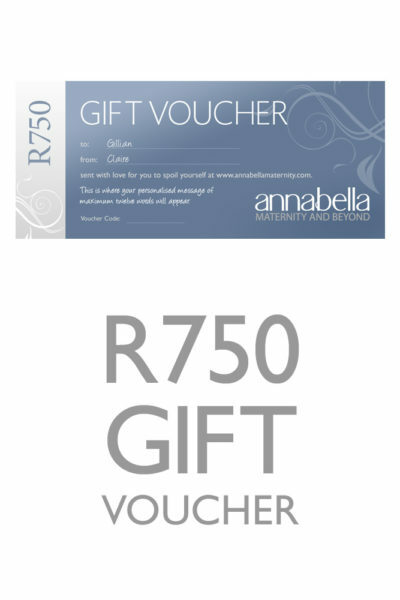 If you are not completely happy with your annabella purchase we’ll gladly exchange it or give you a refund. Create your own gift registry for a baby shower, stork party or any special occasion. Choose who you would like to share your wish list with and send them the URL that gets mailed to you. Public wishlists are viewable by anyone and appear in search results if the search terms match the wishlist title. Shared wishlists do not show up in a search, but are viewable by anyone that has been given the URL that links to the wishlist. Private wishlists are only viewable by the wishlist owner. Please note: Wishlist items are subject to availability at the time of purchase. Treat someone to a gift of their choice with a beautiful, personlised gift voucher. We can e-mail this voucher directly to the recipient with a message from you, or you may choose to have it sent to you to print out and give as the perfect gift. Please make sure you add the e-mail address you’d prefer the voucher. Then, include the lucky recipients name, a short message (10 words or less) and your name in the ‘message’ section. An email will be send to the recipient. Please note: 1) Vouchers are redeemable within our online store only 2) Vouchers are valid for one year from purchase. 3) Vouchers may not be exchanged for cash. 4) The voucher code is important. It needs to be entered into the checkout process in order for the voucher to be redeemed. Have you been looking for a more personal touch for your online shopping experience? Look no further. Earn points every time you shop that can be redeemed in the form of a voucher off a future purchase of your choice! To help you with your shopping experience, here are answers to the most frequently asked questions. I have received my clothes… I am sooooo happy. Thank you so much! It’s all stunning! I am so impressed with the service and quality. I’ll be sure to tell all my friends about you guys. Thanks so much! I’ve actually been meaning to email you guys to tell you how absolutely amazing I think your online business is. Not only are the products amazing – comfortable and fit easy but your turnaround times and service in terms of the online experience is amazing.